If you hop on your bike for a nice ride, chances are you're not thinking about things that could go wrong. Still, if you feel you should be prepared, for yourself or one of your riding buddies, this is the helping hand in times of need. The Motorcycle Storehouse First Aid Kit is specifically composed, in accordance with DIN 13167, for motorcycle use. It is even required by law to carry one on your bike in many European countries. The kit includes first aid Instructions, rubber surgery gloves, insulation blanket to help prevent shock, dressings, bandages, self-adhesive plaster, gloves and scissors. Comes in a zippered nylon bag which is approximate 15cm wide x 12cm high x 5cm deep, with a weight of just 247 grams. Might as well give your Motorcycle Storehouse dealer a call. Better have and not need than need and not have, eh? 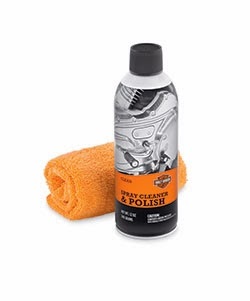 MILWAUKEE - Keep road-trip grime under control with these two new packable surface-care products from Harley-Davidson® Genuine Motor Parts and Accessories, perfect for rest-stop touch-ups and rally detailing. The new Bug Eater Sponge (P/N 93600110, $7.95) is tough on bugs but gentle on other surfaces. 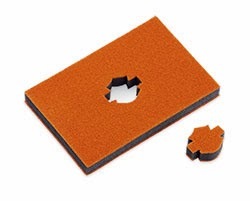 This easy-to-grip pad features a strong, flexible core laminated with double-sided cleaning surfaces. When paired with water and Bug Remover or Wheel & Tire Cleaner sprays, the textured orange surface helps break down and dissolve baked on bugs and road grime without scratching the surface below. The Spray Cleaner & Polish + Microfiber Kit (P/N 93600108, $11.95) is the perfect on-the-road cleaning companion. Spray Cleaner & Polish aerosol waterless quick cleaner/detailer floats dirt and dust off the surface for a quick and easy cleanup. A Microfiber Detailing Cloth is soft and durable for detailing, cleaning or buffing. The washable cloth can be used wet or dry, and is safe for use on all surfaces and finishes. All H-D™ Surface Care Products are tested extensively in the lab and in the field, and certified by Harley-Davidson engineers to be compatible with each other and with specific Harley-Davidson® paint surfaces, metal finishes, and wheels.